Searching for some inspirational quotes on ambition and goals in your life. If yes, you don't need to search for them anymore. As here I have compiled down some of the inspirational ambition quotes and sayings. Just hope you will like the quote compilation and learn something new from here. Potential is an excuse to procrastinate; Ambition is a means to thrive. Always strive to get to the top in life because its usually crowded at the bottom. Put work into your dreams. You will never know how high you can climb until you reach the top. Ambition is the bridge between reality and living a dream. 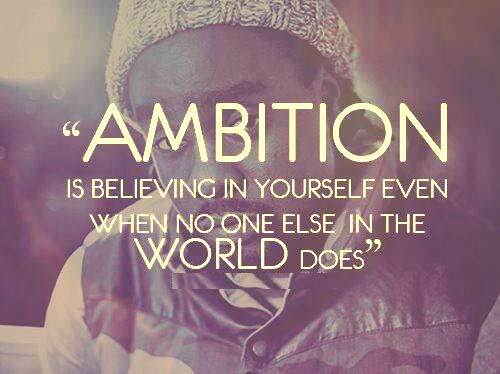 Ambition is a drug that turns it's addicts into potential madmen. Follow your star, it's never too late, even if it doesn't quite happen as you expect. Too many people out there tell us what we can and cannot do but…they don’t know who we are, what’s put in us. People with ambition don't give a damn what other people think of them. It never occurs to her that she will not be a writer and only occasionally does it occur to her, depressingly, that she is going to grow into a woman, not a man.